MinGW, a contraction of "Minimalist GNU for Windows", MinGW is a port of the GNU Compiler Collection (GCC), and GNU Binutils, for use in the development of native Microsoft Windows applications. Offered in easily installed binary package format, for native deployment on MS-Windows, or user-built from source, for cross-hosted use on Unix or GNU/Linux, the suite exploits Microsoft's standard system DLLs to provide the C-Runtime and Windows API. A port of the GNU Compiler Collection & GNU Binutils for devoloping Win Apps. 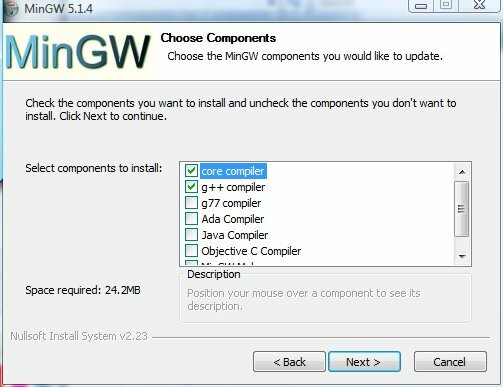 MinGW is augmented by additional function libraries for improved ISO C-99 compatibility, and further, by community supported add-on tools and libraries, many pre-built, many more in the form of "mingwPORTs", to be built by the end user. MinGW provides a complete Open Source programming tool set which is suitable for the development of native MS-Windows applications, and which do not depend on any 3rd-party C-Runtime DLLs. MinGW is a native Windows port of the GNU Compiler Collection (GCC), with freely distributable import libraries and header files for building native Windows applications; includes extensions to the MSVC runtime to support C99 functionality. Qweas is providing links to MinGW 5.1.6 as a courtesy, and makes no representations regarding MinGW or any other applications or any information related thereto. Any questions, complaints or claims regarding this application MinGW 5.1.6 must be directed to the appropriate software vendor. You may click the publisher link of MinGW on the top of this page to get more details about the vendor.